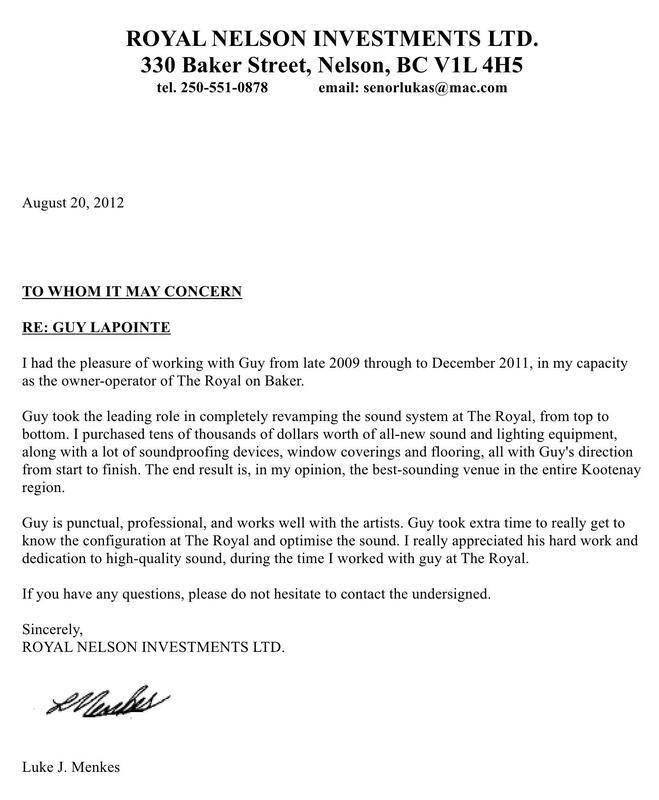 This is a letter expressing my appreciation and recommendation for sound man Guy Lapointe. Over the years I have watched and witness first hand Guy's growing ability as a technical engineer. For me, as a musician, it is important that the sound person I am working with is sensitive, knows his stuff, yet willing to learn and humbly remain open to suggestions from the performer. For me, Guy has effectively earned his merit in all these areas. I met Guy 11 years ago playing at a well established venue in Nelson BC at the Sub Pub (DTSS). Since then I have worked with him numerous times. I am very thankful for his dedication to his craft. There was one time when it had been a couple of years in between since Iï¿½d worked with him, and he still remembered what songs needed what in my musical repertoire. I was so impressed with this! As a singer-songwriter I am exacting and conscientious with the music I write. As a result, Iï¿½m a pretty picky galï¿½(smile) And you knowï¿½with Guy I donï¿½t have to worry. I appreciate his compassion to my sensitivity musically. I value his ability to appease my perfectionist heart. Guy has been doing this for many years! He has always been on time, ready to please, open minded and very forgiving if the pay wasnï¿½t always thereï¿½ his main aim being to perfect his technique and gratify who ever he worked for. This man deserves thumbs up as far as Iï¿½m concerned! A good working relationship is extremely important between the ï¿½sound guyï¿½ and the ï¿½artisteï¿½. A waxing creativity is the result. I would recommend Guy Lapointe anytime. 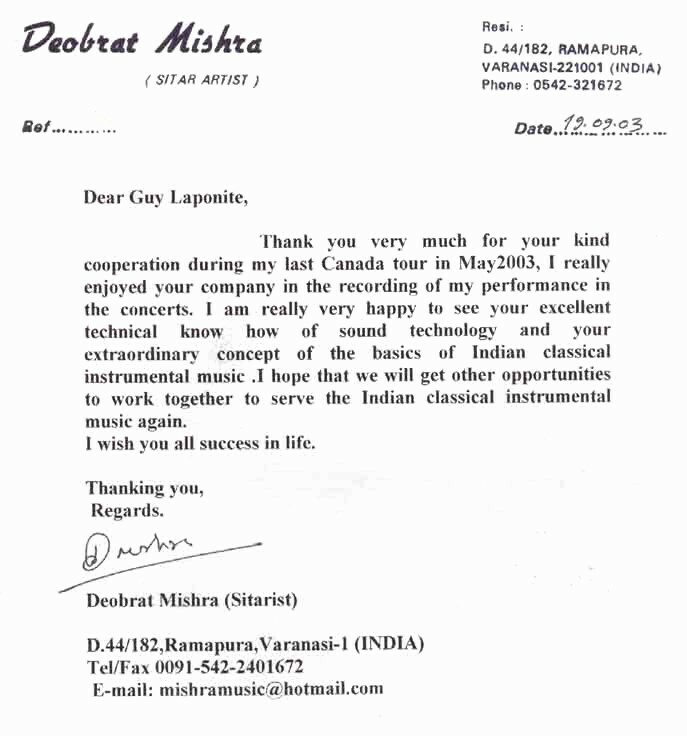 I am writing this letter at the request of a colleague of mine, Guy Lapointe.ï¿½ Over the past 10 years,ï¿½ I have worked with Guy on many occasions, as he has been the sound tech for some shows I played in various venues.ï¿½ The agency also has booked many groups that Guy has worked with in the past 3 years. Guy is an excellent sound man and is easy to work with.ï¿½ He strives to create the best sound possible by listening to, and meeting the needs of each player.ï¿½ His experience is appreciated and respected.ï¿½ He gets great results in regards to balance and tone, and can mix a wide range of acts spanning over many different styles. Guy has toured with one of our more popular folk alternative groups; Jeremy Walsh.ï¿½ Jeremy was so impressed with Guyï¿½s work that he hired him after the first gig they did together, and currently requests him whenever the group tours currently. In conclusion, I have found Guy to be a fine sound technician and a good person to work with.ï¿½ I recommend him for any show. Guy is reliable, responsible and is always on time. If you are in need of any more information please contact me at the above telephone number. Guy works well and gets along with all our staff. Always trying to help out with extra duties. He is excellent at repairing and maintaining our sound equipment. Personally I think Guy is a very kind, honest and giving person. He has the best natural ear for sound quality and we enjoy working with him. ï¿½ I used to sound at a little club, called the Sub-Pub in Nelson, B.C. I tired of doing this as it was a volunteer position and wanted to go back to just having some fun. When I stepped out then my friend Guy stepped in. He sunk his teeth into the job at hand and learned it all very quickly. Next thing you know he was being paid around town for his services and gaining respect for his hard effort. ï¿½ I have seen him grow into a qualified soundman that will take the P.A. by the horns and subs and round out a very good mix. He is respectful of those he works with and will communicate to get the job done right. His mixes always end up at good levels and he keeps his wits about him so that as the night progresses the volume does not get away on him. ï¿½ I believe that anyone that hired him to do sound would be doing themselves a favor. ï¿½ Canï¿½t wait to hear what he can do now that I have been absent from his gigs for some time now. Regarding Guy Lapointe. I've always been impressed with Guy's abilities as a sound man. Having worked with him as a musician and an events coordinator I've found him to be easy to work with and always on top of his gear and the room. It's his ability to get the best sound in the most challenging situations that qualifies him for my most enthusiastic endorsement. The biggest band in the smallest room always sounds clear and balanced. He's easily my first choice when it comes to engineers. Guy Lapointe really knows how to get great sound out of a band. He isï¿½ also a very objective person who is not afraid of dealing with problems head on. My experience with Guy on the road with the Jeremy Walsh Band was entirely positive and would not hesitate to have him on board again should the need arise. This is a letter of recommendation for an excellent worker. Mr. Guy Lapointe worked for me for over two years as a promoter for hiring bands for my Business plus soundman, lightning, and heavy equipment and never hesitating to take on any job. I am proud to know him as a friend and a dependable worker. He would be an asset to any form of business he takes on. cute. Sweet, hairy, understands the different ends of an xlr cable.. I don't know man.... out of the hundreds of sound dudesï¿½ you're in the top ten... and hey that's good... lets say we've had 200 soundman... you're in the top %5 percent!!! Yeah!!! make mistakes so that you can learn by experience rather than hearsay. I would highly recommend Guy for any sound technician, or training position. I've known Guy Lapointe now for several years. I have worked with him in a variety of capacities. In each of these capacities I've found him to be trustworthy and hardworking. Furthermore, his attention to detail makes him a valuable asset to any endeavor. My experience of Guy Lapointe as a soundman is very positive. He helps bring the music alive through his mix. He is very friendly and professional and was always a pleasure to work with. My band played in Nelson at the Queens last year when we were on tour with the Yoko Casionos. Guy was nothing short of amazing. It was well advertised, he ran a mean PA system, and was very accomodating with both the bands. Guy provided a great stop enroute to Alberta from Van. I'ld work with Guy again anytime. I am writing this letter of recommendation for Guy Lapointe. I am a musician/singer and have worked in Nelson BC at the Queen's Hotel and other venues for many years with Guy being the sound and lights technician. He is easy to work with, has a very pleasant demeanor and always does a great job. He is reliable and very capable and I recommend him highly. Guy is a hard worker and wants to succeed in his endeavors. Guy is always looking to better himself in someway and truly cares about people and the world in which we live. I met Guy at the David Thompson Cultural Societyï¿½s old space on 10th. Ave. in Nelson B.C. called the Sub Pub. We needed a volunteer soundman and Guy came to the rescue and took over the position full time. Now he has raised to one the most powerful soundmen in all of Nelson and area. I'm proud to know this man. ï¿½ï¿½ï¿½ï¿½ï¿½ï¿½ï¿½ï¿½ï¿½ï¿½ï¿½ I worked with Guy Lapointe while I was touring with my band, "Dirty and the Derelicts". I found him easy to work with as far as setting up our sound. He listens well, I only had to explain our usual setup to him once. We played a total of five sets over two different nights, there were DJs (turntables) performing in between our show nights, so the system was torn down and set up again between shows. I didn't notice any inconsistencies between the two evenings, and everything flowed well throughout both performances. I asked members of the audience how the sound was, and their comments were positive. I myself at one point ventured off the stage with my guitar during a performance, and was impressed by the balance of the instrument levels, and the clearness of the vocals. Overall, our gigs with Guy on sound went well, and they were among the more enjoyable shows we have played on the road. I would definitely enjoy working with him again, if the opportunity arises. Guy had quite a work load assigned to him this year in that he had two stages to operate with offset scheduling.ï¿½ This meant that he really didnï¿½t get much of a break all weekend.ï¿½ He was an amazing trouper though, throughout the entire Festival. Guy was always on time, professional and Very Good at his job ï¿½ he never missed a beat and never complained about the very long hours or the impossible heat. The performers also appreciated working with Guy ï¿½ he was able to follow last minute changes thrown in without any problem.ï¿½ This means the world to organizers responsible for keeping the Festival flowing. I strongly recommend giving this hard worker a position on any team. Would we hire him again? - in a heartbeat.